Remember two reviews ago when I discussed Brown’s Hurricane Katrina book? Well, recently I discovered another work of American history by Don Brown, this one covering The Great American Dust Bowl. 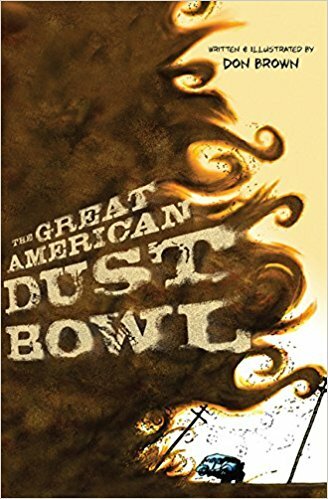 Slightly shorter than Drowned City, The Great American Dust Bowl takes the same unapologetically immersive approach and tosses readers into the dirt, mud, death, and depression that was the “Dust Bowl”…a term coined by news reporter Robert Geiger, as I discovered in the book. You will learn something from this book, as I’m sure you would from Drowned City. Brown has an amazing talent for editing information, shaping his research to quickly educate, and creating simple images that make each page memorable. His books are a quick read that will give you lots to take with you. And I believe that this is why his books would be killer in the classroom: kids want quick fixes that move them. This book does that. I read it in 20 minutes, and I recommend it to everyone. Like a Apple commercial, it quickly hits at your heartstrings, unlike an Apple commercial, it never feels forced or contrived. The accessibility of this book also lends it well to pair with a ton of other books, short stories, films, etc. Add this to a unit on “Loss,” or “20th Century America,” or “Environment.” Get this book, share it with people, and get it into lesson units! 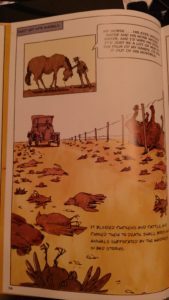 Warning: In both this book and Drowned City, Brown discusses sick and dying animals as a result of the catastrophes. If you are an animal person, like me, get ready.